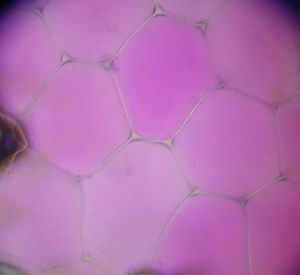 Epidermis cells of Rhoeo discolor after plasmolysis. The vacuoles have shrinked. The vacuole is a large organelle found in prokaryotes and within the cytoplasm of eukaryotic cells. It frequently occupies the majority of the space inside plant cells where it typically exists as single transparent vesicle in mature cells, but small in some meristematic cells. Like most organelles, the vacuole is membrane-bound compartment, and may function in a variety of systems such as digestion, secretion or excretion. In plants, it plays important roles in the storage of various products, by-products, nutrients and water. It is also used for sequestering unwanted debris, and toxic materials. In herbaceous plants it provides turgor pressure necessary for the structural support of soft tissues. Wilting in such plants is due to water loss within the vacuole. Vacuoles serve as storage compartments for food, water, or other substances. Protists, organisms without cell walls, that live in hypotonic media (freshwater species), as the ciliate Paramecium, have contractile vacuoles, which periodically excrete fluid. 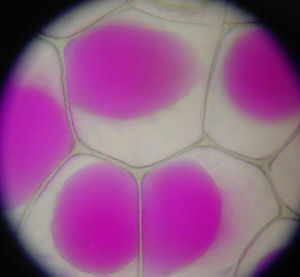 Vacuoles are often pigmented, and the spectacular colors of petals and fruit reflect the presence of compounds such as the purple anthocyanins in the vacuole. ↑ Stansfield, William D.; Colomé, Jaime S.; Cano, Raúl J. Molecular and Cell Biology. New York: McGraw-Hill. p. 4. ISBN 0-07-139881-3. ↑ Freedman, Jeffrey C. "61:Physiological Adaptations of Protists". In Sperelakis, Nicholas. Cell Physiology Sourcebook:A Molecular Approach (3rd ed.). San Diego, California: Academic Press. p. 1044. ISBN 0-12-656977-0. ↑ Bolsover, Stephen R.; Hyams, Jeremy S.; Shephard, Elizabeth A.; White, Hugh A.; Wiedemann, Claudia G (2004). Cell Biology. Hoboken, New Jersey: John Wiley & Sons. p. 11. ISBN 0-471-26393-1. This page was last modified on 31 August 2014, at 21:48.